Every fall I welcome the cool crisp autumn air, the shorter evenings, and of course, fabulous food made with seasonal produce! My favorite? Pumpkins. I can’t resist stocking up on things like pumpkin butters, purées, and pasta sauces. And I also love decorating with fresh pumpkins and gourds, especially when creating beautiful tablescapes. When I’m out and about, I also enjoy occasionally treating myself to breakfast at a local coffee shop that has tempting pumpkin-inspired drinks and baked treats on the menu. But, of course, I know they’re not that healthy for me. So, to enjoy such things more frequently, I decided it was time to hunt down some healthy ways to enjoy pumpkin for breakfast at home. A few of them I came up with myself and a couple of them are from fellow bloggers. Check ’em out and let me know if you get a chance to try any. Don’t they sound good? 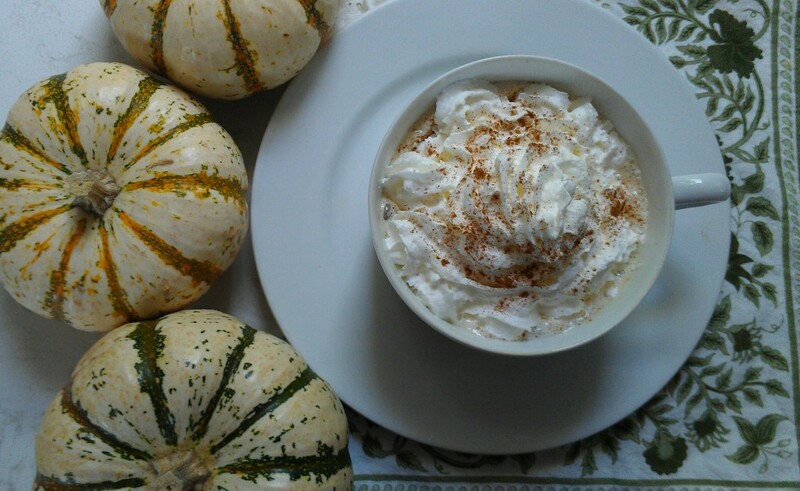 Guilt-Free Pumpkin Chai Tea Latte. Substitute high-calorie, sugar-laden, and empty-calorie coffee shop drinks with this healthy chai tea latte recipe. Chai tea is lower in caffeine than coffee, plus its high antioxidant content supports health and wellbeing. For example, the spices in chai tea (i.e., black pepper, cinnamon, cardamom, clove, fennel, ginger, nutmeg, and star anise) are warming and aid digestion. Perfect for a cool, fall day! Pumpkin Pie Breakfast Yogurt. A slice of left-over pumpkin pie may be a tempting breakfast or snack, but your body will thank you if you give this yogurt a try instead! The yogurt’s probiotic content aids your digestive and immune system and the pumpkin butter and agave syrup add in natural sweetness with the benefits of vitamins and minerals. To make it, simply blend together one cup of organic vanilla or plain yogurt, 1-2 tablespoons of canned pumpkin puree or butter, a little pumpkin pie spice or cinnamon, and a touch of agave syrup to sweeten it to your liking. Top with some ground flax seeds and pecans for added protein. Gluten-Free Pumpkin Muffins. Check out this awesome recipe for pumpkin muffins using brown rice flour as a base from Kitchen Stewardship. They are not only gluten-free, but also free of dairy, soy, eggs, and nuts — truly an allergy-free muffin! Pumpkin Pie Baked Oatmeal. If you love the convenience of to-go breakfast food, you’ll love this recipe from My Whole Food Life. It only takes about 30 minutes to make and you can freeze the leftovers for future use. Easy, delicious and nutritious. Creamy Pumpkin Protein Smoothie. Enjoy the flavor of a creamy and delicious pumpkin smoothie as a healthy beverage treat. Simply use to your liking some pumpkin puree or pumpkin butter, vanilla almond milk, pumpkin pie spice, banana, protein powder, and vanilla yogurt. Yum! Tip: Freeze the banana ahead of time to make the smoothie thicker. Pumpkin Beauty Spa Treatments You Can Make for Pennies! Copyright © Karen Peltier and Well Gal, 2012 – 2014. All rights reserved. Hi Karen, thanks for the post, looks very delicious. YUM!!!! I <3 Pumpkin so yeah, this is pinned! Pumpkin is plentiful during this time and coming up with healthy pumpkin food is a smart move. You have shared great recipes, I like the Gluten-Free Pumpkin Muffins best and I will try them. I never thought of pumpkin as food for breakfast, but your recipes sound delicious. Pumpkin flavored yoghurt, what a great idea! It is that time of the year again when pumpkin is in season! I really like eating pumpkin in a variety of ways. Pumpkin pie and muffins are two of my favorite! Once again, I believe my mom would like these recipes, so I will pass the word to her haha. Thank you for sharing! Yum. These sound so good! I love pumpkin, especially fresh. Gonna give some a try. Heather recently posted…Tea Tree Oil – Is it Worth the Hype? Hi Karen, I love pumpkin! I’ve never had pumpkin butter or pumpkin yoghurt, oatmeal or even pumpkin pie. When I cooked a lot, I used to make pumpkin muffins and scones and they were really yummy. Julieanne van Zyl recently posted…Can you double your Click-Throughs from your homepage? Never had pumpkin pie? You must give it a try! It’s one of my absolute favorite desserts. If you have some, don’t forget the whipped cream on top or at least a scoop of vanilla ice cream on the side. It’s delish! Welcome. I’m glad you got inspired by the idea of using pumpkin for breakfast. The yogurt really is delicious, so I hope you give it a try! Thanks for stopping by and for the complement on the header. I appreciate the positive feedback!